I hate the way the recipes are written in this book…this comes from my professional chef brain where anything that serves six will be multiplied by at least 5…so, imagine counting out tablespoons!! It is of course ridiculous and is the reason that many of my cookbooks have weights scribbled all over them. Anything good is later adjusted and put onto a spread sheet. Actual weights for all ingredients are the saviour of consistency especially for less accomplished cooks. If you want proof of this get three people and, without watching each other, ask them to use a tablespoon measure and measure four tablespoons onto a scale…bet is not one of them will be the same. 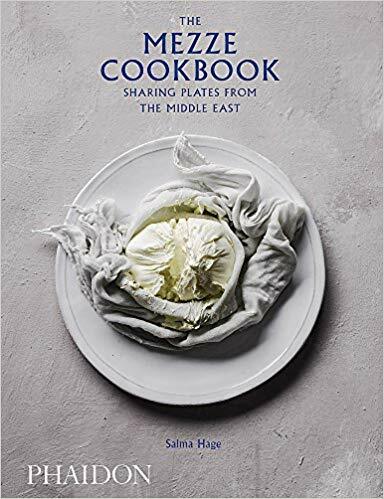 Forgetting this personal annoyance Hage’s Mezze Cookbook sings with interesting mouthwatering recipes and ideas, in particular many excellent vegetarian and vegan ideas. The gorgeous photography of Liz and Max Haarala Hamilton almost steals the show and for those of you who need plating inspiration there is plenty in this book. Hage’s food is really tasty and interesting but does not stray from the simplicity of the Middle Eastern kitchen; it just makes you want to eat. Breads are a vital part of the Middle Eastern meal and there is a very interesting section with breads which I am yet to put through their paces. I especially like the way Hage has taken the obligatory preserves and pickles of the Middle Eastern kitchen and given them a contemporary revamp. This is a book full of inspiration that is especially relevant in my home town of Adelaide, South Australia, where these ingredients are abundant and can be found just picked at our local Farmers’ markets. They are also ingredients we quite often grow in our own kitchen garden. Highly recommended and make sure you use the link to the photographers’ web site to see some truly wonderful food photography.